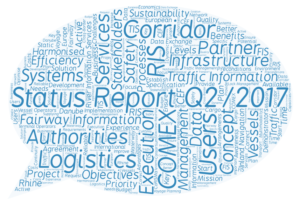 The second quarter of 2017 was focusing on the definition of the basics for all services that are envisioned to be realised on Corridor- or even on European level within the project. Several workshops of the established Core Teams took place to ensure an efficient discussion and progress: 19th of April in Vienna, 30th to 31st of May in Vienna (Sub-Activity Leader Meeting), 6th to 8th of June in Rotterdam and 28th to 29th of June in Vienna. The progress of the service definitions is so far in-line with the planning, however still with a lot of work ahead for the partners to finalise the service definitions until the end of 2017. Furthermore, the RIS COMEX project was presented to a broad audience at the Common Issues Day during the RIS Week in Belgrade on the 10th of May. A first successful meeting of the so-called RIS COMEX Industry Reference Group took place on 17th of May in Brussels where the project coordination team discussed with representatives of European branch organisation about their involvement and further cooperation within the project. On the 19th of June, the first meeting of the project Steering Committee took place in Vienna where the first milestones were approved, relevant issues were discussed and next the steps were agreed on.